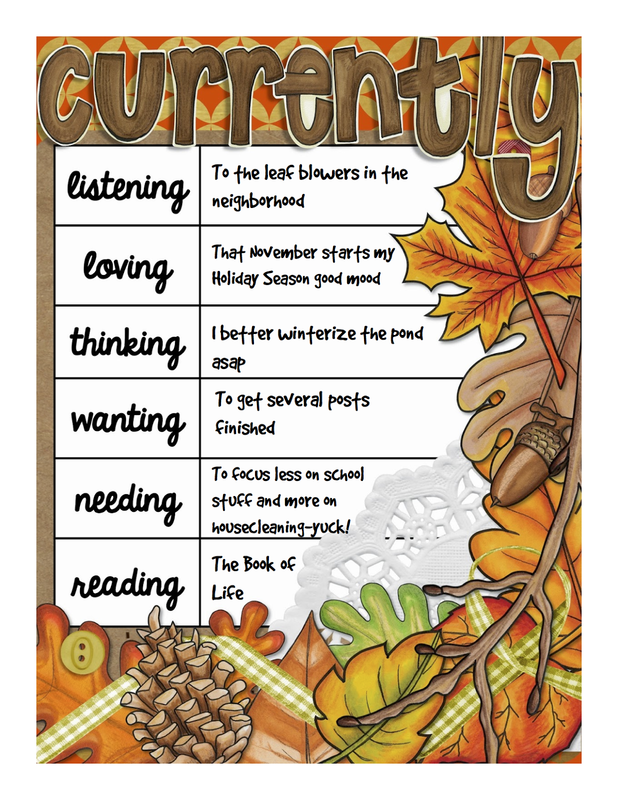 I'm linking up with Farley at Oh Boy, Fourth Grade for Currently November. Here's what's happening! Listening to.. and loving... the sounds of Autumn! Crunchy leaves, football fans, rakes and leaf blowers. It's all good. Loving the long holiday season that is coming up! Pretty decorations, festive food, friends and family, time away from school, lots of activities! It's all good. Thinking about that pond I love... except for this time of year. I did the first steps to winterizing a few weeks ago.. and then the dog fell in! Gotta finish it up today while trying to touch the water as little as possible because it is COLD. Winterizing works, though– last year I didn't lose a single fish! It's all good. Wanting to finish up several posts. I just posted about the Liebster Award. A nice surprise and perk that Pixie Anne gave me. I'm passing it on! And I have a new student display space that my kiddos are using and loving and I gotta share about that. Waiting for a Monday Made It! And I've got several things going for Five for Friday, and it will be Funny Kid Friday as well. Yep, lots of writing and finishing touches to do this week. It's all good. Needing to give the house a shake down. I don't think it ever gets as dumpy as during the back to school season... except we've been in school for two months and it still looks so cluttered. I had both daughters home this weekend and looking at it through their eyes I'm sure they were thinking, Mom, you used to say it was US who messed it up! Gotta make it a priority in the next few weeks before it's holiday time. It's all good... soon. Reading... well, actually just finishing The Book of Life by Debra Harkness. It is the last in the All Souls Trilogy. This series was recommended to me by my favorite bookseller and she really knows good fiction. It features witches and vampires with a nice dose of history, and sense of family thrown in. Thoroughly engrossing. So sad to see it end! Gotta go see what's next in the book pile... What would I do without books! This is the detail of everyone else's post that I'll be giving the most attention to. I love hearing about good books. Click on back to Farley now! It's all good. I am with you on the housecleaning! It just seems to take a serious back seat this time of year. So much to write about and so little time! Good luck on your posts! I am with ya on the house cleaning. I can just never seem to get totally caught up. The holidays are my favorite time of year as well. I just love spending extra time with family and catching up with many of them that we haven't seen in quite a while. Looking forward to Funny Kid Friday. Have a great week. I love my house during this time of year. It feels more homey than any other time of the year. Sounds like you are going to be blogging like crazy and I cannot wait to read all your posts. I know they will be awesome!